Through just under a month it seems as if Jason Botterill’s train of thought on reshaping Buffalo’s blueline is similar to that of his predecessor. Addressing the lack of talent and depth on Buffalo’s blueline would be the priority of any general manager and while the market for defenseman will be tight, there are more avenues to explore than the most popular bandied about on Twitter. Anaheim and Minnesota might be the most popular targets, but there are plenty of other teams who may find themselves in a tight spot when the expansion draft comes around. Botterill took the first step towards shoring up the defense corps by finishing the Victor Anitpin saga. He could have easily walked away from the puck moving Russian but Antipin’s resume and Buffalo’s glaring need for help likely kept Botterill from pulling the contract offer off the table. Despite not knowing what he will offer at the NHL level, Antipin is already Buffalo’s fourth – if not third – best defenseman despite never having set foot on the ice for the team. Antipin’s resume is certainly that of a mid-pair defender but at the very worst he’d see third pairing minutes if his game doesn’t translate for whatever reason. His addition not only helps fill a hole on Buffalo’s blueline but it gives the team another puck mover, something they badly needed. Puck moving defensemen will likely be the name of the game for Botterill and the Sabres. Even though Antipin wasn’t a player he had sought out to sign, wrapping up the contract says enough about Antipin’s ability and the type of player Botterill is likely to covet. Taking a look at Pittsburgh’s blueline can tell you that much more as Kris Letang, Justin Schultz, Olli Maatta, Trevor Daley and even deadline acquisition Marc Streit are adept puck movers. Not all of those players can be traced directly to Botterill’s former duties with the Pens, but it’s unlikely he had no influence over acquiring them either. Pittsburgh may even be a team Botterill attempts to pull another defenseman from as the offseason progresses. While the Pens aren’t backed into a corner like Chicago or Minnesota, they still need to make a decision on a few contributors. Ian Cole, Justin Schultz and Brian Dumoulin all need to be protected in expansion, as do Patric Hornqvist, Carl Hagelin and Bryan Rust. Meanwhile, the Pens already have three forwards with no movement clauses, meaning they’ll need to choose between leaving a number of young forwards exposed or dangling multiple defensemen. Players in bold are likely to be left exposed in expansion, thus potential targets on the trade market. What seems to be the most likely route for the Pens is to expose Ian Cole while protecting Schultz, Maatta and Letang. That would also leave Dumoulin exposed (along with Derrick Pouliot) available to be selected by Vegas in expansion, thus creating an opportunity for another GM to strike. This is the same situation that Anaheim and Minnesota find themselves in due to a host of no move clauses and deep positional strength in some cases. 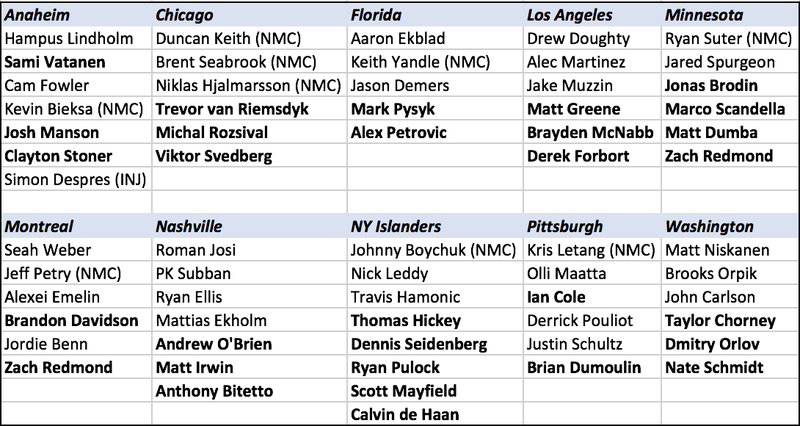 Other teams who will likely find themselves leaving a quality defenseman exposed to expansion include: Chicago, Florida, Los Angeles, Montreal, Nashville, Islanders and Washington. The graphic above indicates the defensemen each team must protect and identifies a number of players who I feel the Sabres should target via the trade market. Each team listed faces a slightly different challenge when it comes to expansion. Most simply have too many eligible players to protect under the league guidelines. Anaheim, Chicago, Minnesota and Pittsburgh all have a number of no movement clauses which will likely force their hand. Some have too many talented forwards (Florida, Minnesota) to choose the eight skaters, one goalie option. For the most part it’s a confluence of factors which point to some sort of balancing act on the part of each respective GM. One caveat here is that not all of those teams will likely be staring down these roster conundrums by June 17. Washington, for example, could choose to expose Brooks Orpik, knowing it would be unlikely the Golden Knights would want his contract, thus allowing Dmitry Orlov or Nate Schmidt to be protected. Dangling a big contract like that almost provides a bonus slot for protecting players, it’s a tactic Botterill could very well use with Zach Bogosian, assuming he acquires another expansion eligible defenseman prior to the draft. One other option that will almost certainly be exercised is making a side deal with Vegas so they do not choose one of your valued exposed players. There’s already been one report of an expansion-related trade as rumors are swirling that the Blackhawks may be willing to give up Trevor van Reimsdyk in exchange for the Golden Knights taking Marcus Kruger as well. These type of loopholes can and will alter what options Jason Botterill has. But it doesn’t seem like he’ll be stuck dealing an extremely valuable asset either. The likes of Sami Vatanen (despite his injury), Jonas Brodin and Mattias Ekholm would certainly cost Botterill a significant package. But I don’t believe that Josh Manson, Brian Dumolin or Calvin de Haan would require nearly as much of an investment and each of those players would provide the Sabres with a marked improvement on defense. If given the choice, offering the Ducks a package of the eighth overall pick, a prospect and an additional asset for Sami Vatanen is probably the deal I’d be most interested in making as an armchair GM. But the injury to Vatanen and Hampus Lindholm really shifts the conversation surrounding the Ducks surplus of defensemen. As we discussed on our last podcast, it’s possible that those injuries even give the Ducks the cover they need to protect all of their big guns at the expansion draft. Vatanen would have been my first choice for Botterill to chase – assuming Cam Fowler and Ryan Ellis remain untouchable – with Ekholm, Dumba, Manson and de Haan rounding out a big board of sorts. Vatanen is a terrific puck mover who has a favorable contract and plenty of upside. The rest of that list share many of those traits with youth being key among them. His injury drastically shifts the outlook from Buffalo’s perspective as it’s hard to envision a scenario where they could afford to wait until November or December to see a big offseason acquisition finally take the ice. Some of the players listed above would be borderline second pair players for Buffalo. Davidson and Schmidt, for example. A reunion of Mark Pysyk or Brayden McNabb would be bizarre and frankly unrealistic. I expect Nashville to leave forwards exposed over anyone in their prized top four but I think exploring Josh Manson, de Haan, Dumoulin and any of Minnesota’s blueliners is a worthy venture for Botterill. Acquiring any viable defenseman via trade will go a long way towards giving the Sabres the cover they need on the back end. It would allow Botterill to use free agency to round out the unit as opposed to trying to plug a major hole with a thin free agent class. Hopefully he’s able to swing a deal prior to the expansion draft, there’s certainly plenty of suitors to work with. We should make a deal for Florida’s Mike Matheson. He’s an incredible skater and very aggressive offensively. Very underrated, but was rewarded with a spot on team Canada during the world’s.